Emily Hinkle's free kick goal in five still frames. This is the first. 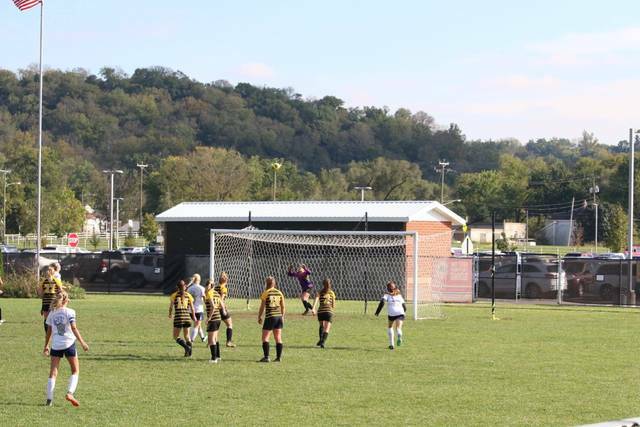 Emily Hinkle's free kick goal in five still frames. This is the second. Emily Hinkle's free kick goal in five still frames. This is the third. 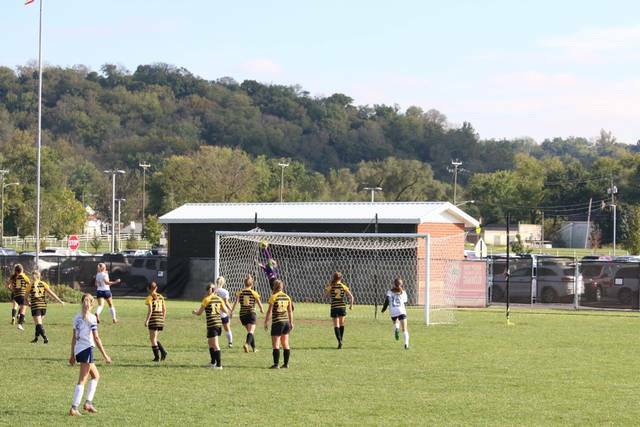 Emily Hinkle's free kick goal in five still frames. This is the fourth. Emily Hinkle's free kick goal in five still frames. This is the fifth. NORTH BEND – The Blanchester girls soccer team tied Taylor 1-1 Saturday in non-league action on the Yellow Jackets pitch. The Ladycats trailed 1-0 at halftime but “a combination of staunch team defending, dominant goalie play from Regan Ostermeier and a moment of brilliance from the foot of Emily Hinkle” allowed BHS to claw back into the game, coach Kurt Ballinger said. Taylor had the majority of possession but Blan defenders Olivia Gundler, Sally Schafer, Bri Haun and Lacie Tedrick helped limit the chances. Ostermeier had 13 saves in the half. With six minutes remaining in the half, Taylor scored its only goal to grab a 1-0 lead. In the second half, Lana Roy drew a foul in the “attacking third,” Ballinger said, giving Hinkle a 25-yard free kick opportunity. Hinkle “hit the free kick pure,” Ballinger noted, and it sailed over the outstretch arms of the Taylor goalkeeper to tie the match 1-1. For Hinkle, it was her 19th goal of the season, third on a free kick. As Taylor looked to take the lead, Haun “had a crucial goal line” clear. Ostermeier finished the game with 25 saves. Savanna Shank was tireless in the midfield as was Gundler in the defensive third, said the BHS coach. Gundler’s performance in the afternoon match came shortly after she won the SBAAC National Division girls cross country championship race in the morning. Blanchester finishes its regular season with a 6-7-3 record. Emily Hinkle’s free kick goal in five still frames. This is the first. https://www.wnewsj.com/wp-content/uploads/sites/22/2018/10/web1_IMG_0631.jpgEmily Hinkle’s free kick goal in five still frames. This is the first. 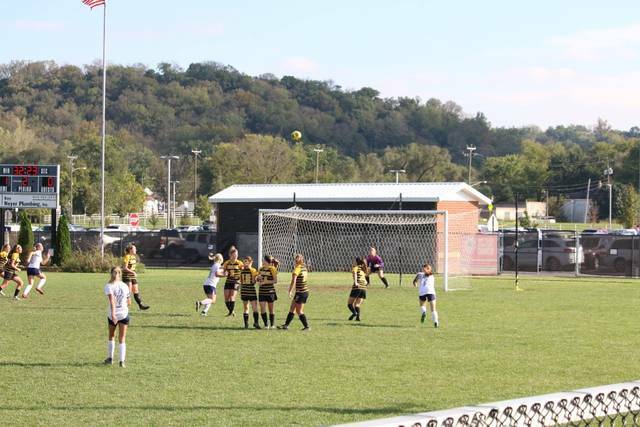 Emily Hinkle’s free kick goal in five still frames. This is the second. https://www.wnewsj.com/wp-content/uploads/sites/22/2018/10/web1_IMG_0632.jpgEmily Hinkle’s free kick goal in five still frames. This is the second. 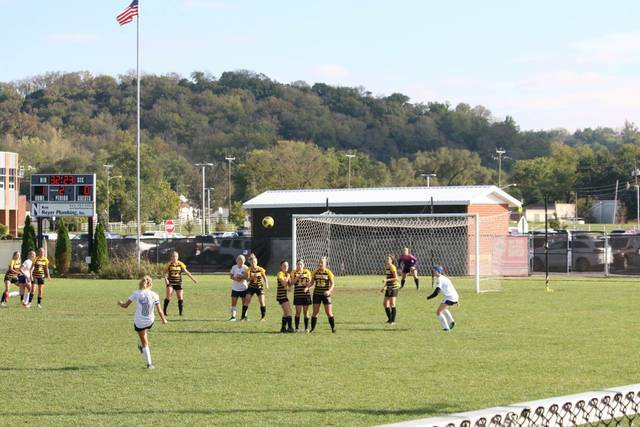 Emily Hinkle’s free kick goal in five still frames. This is the third. https://www.wnewsj.com/wp-content/uploads/sites/22/2018/10/web1_IMG_0633.jpgEmily Hinkle’s free kick goal in five still frames. This is the third. Emily Hinkle’s free kick goal in five still frames. This is the fourth. https://www.wnewsj.com/wp-content/uploads/sites/22/2018/10/web1_IMG_0634.jpgEmily Hinkle’s free kick goal in five still frames. This is the fourth. 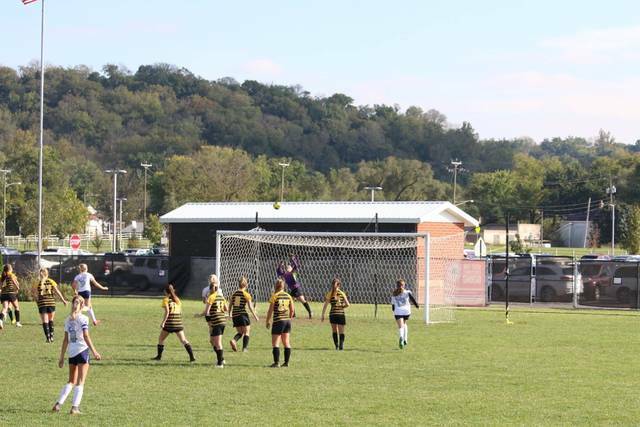 Emily Hinkle’s free kick goal in five still frames. This is the fifth. https://www.wnewsj.com/wp-content/uploads/sites/22/2018/10/web1_IMG_0635.jpgEmily Hinkle’s free kick goal in five still frames. This is the fifth.